Photography and Life by dr Frank: Another spin on the log cabin. While processing the images from the recent wedding, I went back to this shot and 'played' with this image. I wanted to create an image something different. Therefore, I created two layers. 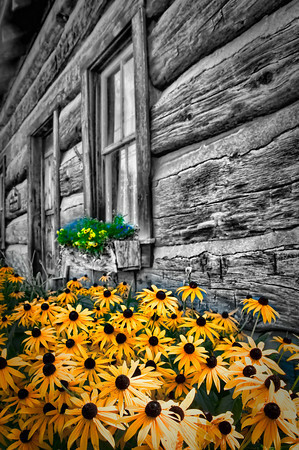 The log cabin, is processed as a strong contrast black and white with the flowers processed in very vivid colors. I cropped the image tighter than the original post. Shot with the Nikon D300 @ ISO 200 hand held. Processed in Photoshop using Topaz Adjust.